My IMDB top 250 film challenge continues. Today I reach my 11th review with the end of my Clint Eastwood cycle. 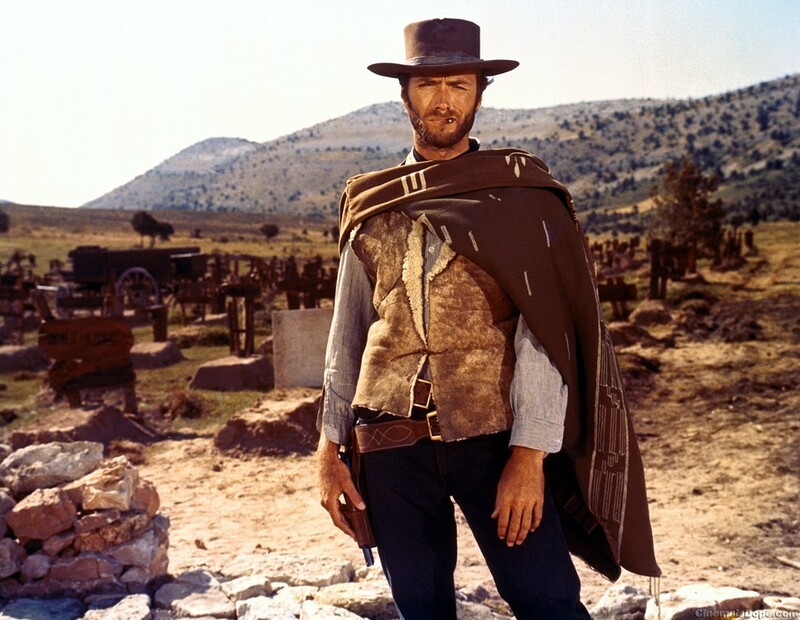 In this post I will analyze one of the most critically acclaimed pieces in the history of film: The Good, The Bad and the Ugly, directed by Sergio Leone and released in 1966. At IMDB, the film never leaves the top 5 and it was, until recently, one of those widely known classics I had never seen. So, this week I can finally say I have cleansed my cinematic soul and proudly declare I have seen the famous Western. As it happened with Unforgiven a few weeks ago, I came into this film with a lot of hesitation. I really did not think it would deliver despite the great ratings it has received since it was first released. You see, I had always come to think of the Spaghetti Western as the genre of cinema where all cliches come to find a home. The image of John Wayne taking down cowboys and stereotypical Indians still burns my retina and clouds my view. To my delight, both Unforgiven and The Good, The Bad and The Ugly (which I will abbreviate from now on with the letters GBU) delivered in style. While Unforgiven was the masterful stroke of Eastwood as a director and a storyteller, GBU was a fun trip from beginning to end. It became apparent to me, from early on, that one of GBU greatest assets is how it meanders through every cliche in the book and makes it work by not taking itself seriously and playing with the audience’s expectations to create one incredibly entertaining story. GBU plays like an epic novel where every character seems to be taken straight from a comic book. There is a caricature of the heartless pay-as-you-go assassin (The Bad), the dirty and poor bandit that is always looking for the next big hit (The Ugly) and the mysterious yet incredibly cocky cowboy that roams the land in search for gold and adventure (The Good). Of all of the three main characters, I was pleasantly surprised to find that it was Tuco, the bandit, played by the eternal Eli Wallach, and not Blondie, the cowboy, played by Eastwood, to be the most interesting and entertaining character. Tuco is, in many ways, the heart of the film, balancing with humor and silliness the cockiness and grace of both Blondie and Angel Eyes, the assassin, wonderfully played by Lee Van Cleef. Tuco is a whole lot of fun because his character seems to remain above all stereotypes. The only thing that is certain about him is that he dreams of riches. There would be no one, not even a brother he still holds dear to his heart, or Blondie, who he grows fond of, that would be able to stop him in his quest for the treasure that a dying man spoke to him about. Angel Eyes, out of the three, is the easiest to define. He is a brutal killer whose only rule is to see a job through to the end, no matter how difficult or how tempting it may be to desist. The film clearly depicts him as the guy the audience should root against as he has no comedic or gentler side to him. For Angel Eyes the goal is only money and that is never in doubt. While Tuco is comedic and even adorable in his messiness and mannerism, Angel Eyes is always business and nothing else. Blondie is a bit of a mystery as the film leaves open the question of whether we should root for him in this adventure. Despite being branded as “The Good” at the end of the movie, Blondie is not altogether decent. His desire is also to be rich but, unlike the other two, he will not go out of his way to cause harm. In fact, Blondie only kills in the movie as a defense mechanism, to protect his life from the common threats of the Wild West. What makes GBU great is not the story though. For Leone, film was very much an instrument to exploit his creativity as an artist and composer. As with previous endeavors, GBU is an opportunity for Leone to explore a great variety of shots, often switching from panoramic to close-ups, using the arid and vast terrain to his advantage to create wonderful compositions. While there are certain elements of GBU’s central story that are sketchy, Leone’s stylistic display of talent is, without question, the film’s strongest aspect. 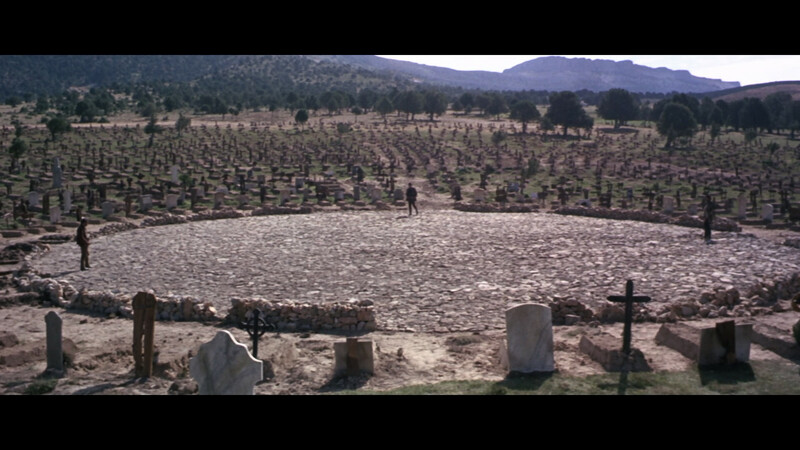 No better example than the masterful scene at the cemetery where Tuco frantically searches the circular grave site as the camera follows him and accelerates until everything in the background becomes a blur of graves passing through. Once the three main characters meet upon finding the treasure we are placed as the spectators to one of the most inventive and fitting endings in the history of cinema, one that is not only clever, but impressively shot by Leone, who grasped the moment with a fine use of creative composition and music.